This quilt has been years in the finishing! Begun early in 2010, this post is being written almost 5 years later. Crazy. 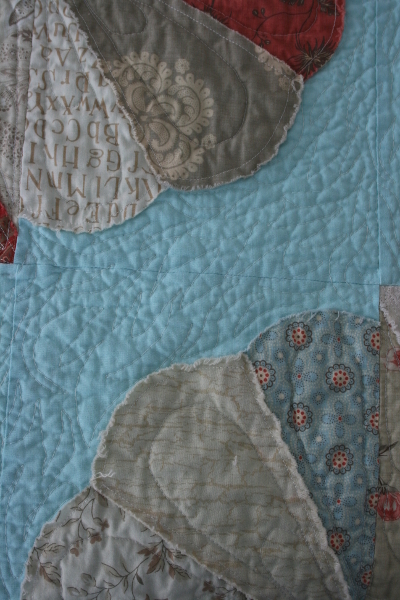 When I originally pieced it, I wanted to have it professionally quilted. It turns out, the longer you wait to quilt sometimes, the easier it is later to do it yourself. Such was the case with this quilt. While I still like it, it’s no longer my current favorite so I became less attached to a professional job. 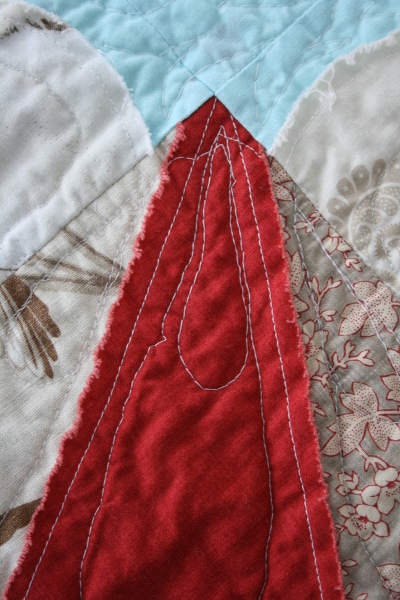 Even so, learning free motion quilting is much easier said than done! 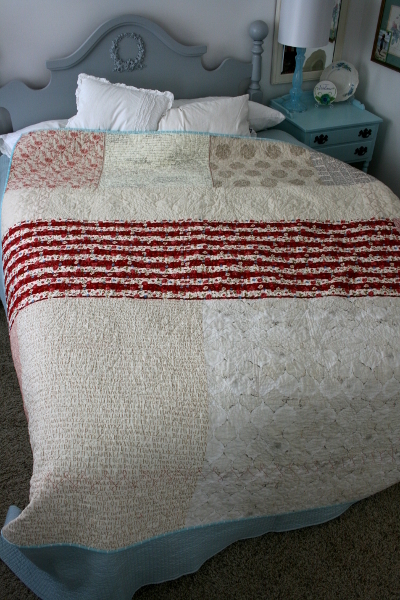 This quilt was worked on, quit, put away, and brought back out perhaps more than any other project of my life. 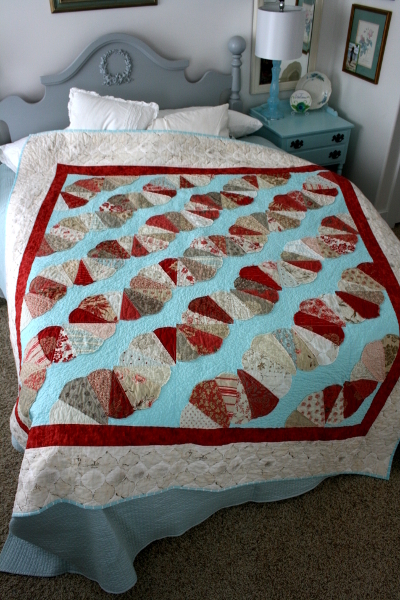 I’d quilt a little and get so annoyed with myself that I’d set aside, vowing to unpick it all. 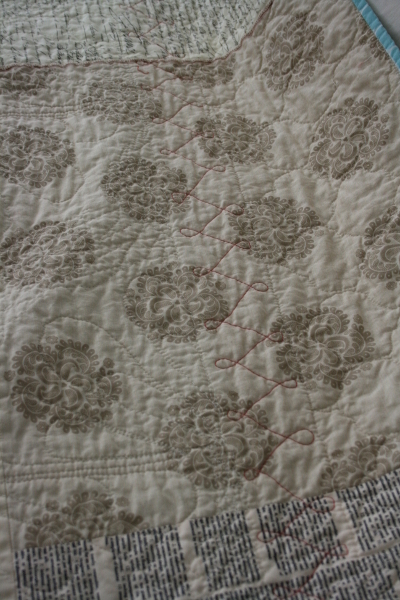 But when I got it out again, I wasn’t in the mood to unpick so I would quilt a little more until the same thing happened. I even remember at one point discovering, after a very rough section, that I’d never lowered my feed dogs! After a while I decided that the name of the quilt pattern, “Life’s Journey” was appropriate for my quilting journey and that I’d leave it as it is, keeping the quilt as a reminder that we all start as beginners at something and slowly get better with practice. The section above is pretty rough, but I also got better in some sections! The aqua background quilting was intended to look like water flowing, but in fact looked more like flames. Yet when it was finished and washed, it simply looks fine. 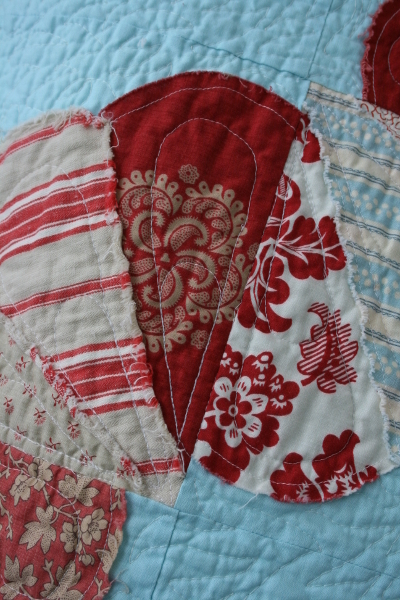 The borders were the last part I quilted (done in December 2013) and I really enjoyed them. It’s the only time I’ve ever used the fabric print to dictate quilting but I love how it looks on this beautiful tile print from Laura Gunn. This is a fabric I’d love to buy yards and yards of if only someone still had it. Isn’t it funny sometimes the things we love? It surprises me how much I love this print, but I love it all the same. For this quilt I pieced a mostly low-volume backing. More of that tile print and the alphabet print too! I also used a few favorite pieces of French General’s first collection, Rouenneries. I had loved French General before they announced their first fabric collection with Moda, so these fabrics were much anticipated. 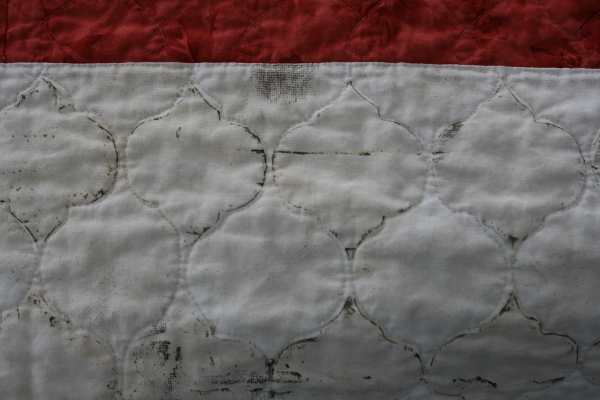 On New Year’s Eve in 2013 I finished binding this quilt. 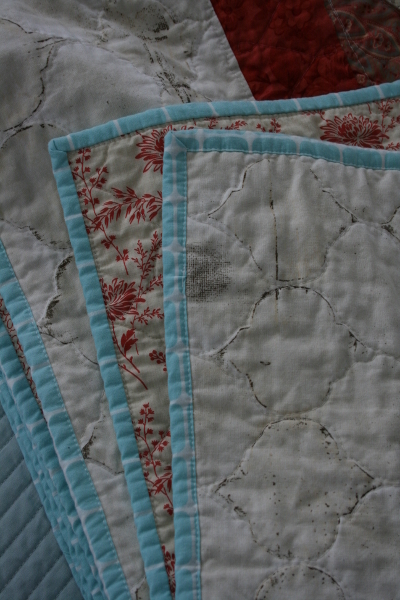 I have no good reason why it took me another year to bury threads, wash, photograph and post about it! Now that it’s done, I’m happy not just with the outcome of the quilt, but also with the process. I’m reminded that it’s the work of experts that draws us to a craft, but we all have to do the work of beginners when we start. So much of this quilt shows the hard work of learning something new, but when you stand back and look at it as a whole, it looks just fine. Which is often how life is. We can get hung up on little details and small areas and forget that in the end it will look like life, no matter how imperfect some spots may be. I’m grateful for that reminder, happy to have learned the lesson – again – in a small way.